These pitchers are made with shatter-proof polypropylene. 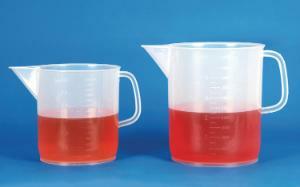 Autoclavable up to 135°C, the pitchers are resistant to alcohol, ethers, hydrocarbons, oils, bases, and most acids. They're marked with well-defined graduations.